letterpress and hot foil printing services for graphic designers. 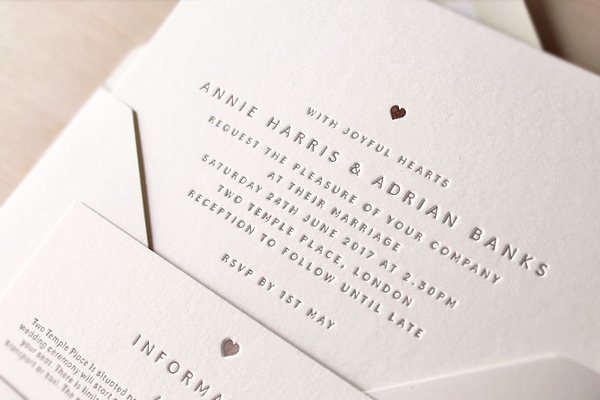 You may be designing invitations or event promotions, a line of stationery or greeting cards, or promotional items such as business cards or postcards that would benefit from the unique result letterpress can offer. Because each project is unique, we prefer to provide custom pricing for each project. We're always happy to estimate your project cost based on preliminary artwork. It can be useful to contact us before the design is complete, so that we can provide pointers for the best printing options. Desired print method, letterpress, hot foiling, blind de-bossing etc. Artcadia offers Letterpress (including Blind Deboss), Hot Foil Printing/Stamping and Full Colour Digital Printing. The only difference blind debossing and letterpress is the use of ink. Blind debossing refers to the lack of ink to create a subtle indentation in the paper, whereas letterpress printing is applied with ink. Hot foil stamping produces stunning results, especially when metallic foils are pressed into the card stock to create a striking look with a gentle, tactile impression. Hot foil stamping requires extensive setup so is Artcadia's most costly print method, but the results are certainly worth it. Vibrant and smooth to the touch, a flat printed and most versatile process for quick colour printing which is inexpensive and perfect for short runs. Digital printing is available on either 350gsm or 800gsm luxe stock. Your digitally printed pieces can be duplexed for an additional charge.